NEW YORK — AFL-CIO President John Sweeney was arrested along with over 80 others, including top labor leaders, elected officials and rank-and-file activists, in a civil disobedience action Aug. 31 supporting GSOC/UAW Local 2110, the graduate student workers’ union battling New York University for a contract. The 80 were arrested during a noontime rally of over 1,200 people. 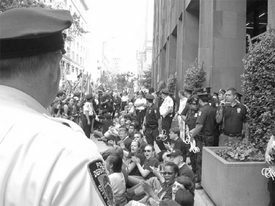 When the group sat down in front of NYU’s Bobst Library, police handcuffed and arrested them. Local 2110 was the first union of graduate students in the U.S. to win official recognition as a bargaining agent with a private university. After a clear victory in a 2000 vote, the Graduating Students Organizing Committee was certified, becoming GSOC/UAW Local 2110. A four-year contract that raised workers’ pay by an average of 40 percent and guaranteed health care was negotiated and ratified in 2002. The contract expired Aug. 31, the day of the rally. The NYU administration walked away from contract negotiations, citing a recent National Labor Relations Board ruling. The ruling removed the legal obligation of employers to bargain with graduate students of private universities. Local 2110, pointing out that the NLRB decision did not bar organizing, says it is now up to the workers and their allies to bring enough pressure on NYU to force them to negotiate a contract. Elizabeth Bunn, secretary-treasurer of the United Auto Workers, said it was part of a nationwide movement. “Teaching assistants and research assistants are organizing to win democracy in the workplace” at both public and private institutions nationwide, she said. Others arrested were Bunn, state Sen. Thomas Duane (D-Manhattan), Fairchild, Unite Here President Bruce Raynor. John Hyland, treasurer of the Professional Staff Congress (PSC), which represents the faculty at the City Colleges of New York, and dozens of graduate student workers. The rally included strong contingents of Unite Here workers from Yale University, who recently won a contract battle there, the PSC, International Union of Painters and Allied Trades District Council 9, Transportation Workers Union Local 100 members and their president, Roger Toussaint, and the American Federation of Teachers. Hundreds of undergraduate students were also in attendance. NYU’s undergraduates have been strong supporters of the graduate students’ demands.